← Gypseys, tramps and thieves! 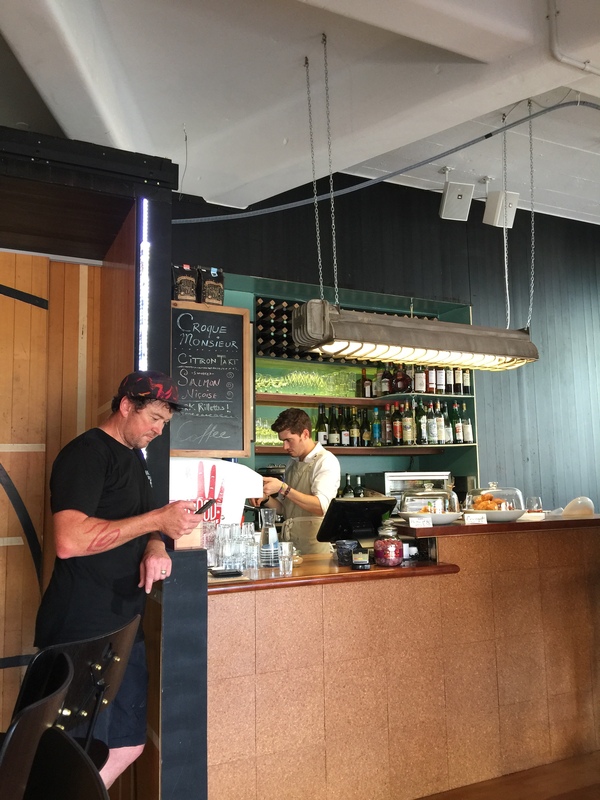 Oui Oui, another leetle French place has sprung up in Welly. 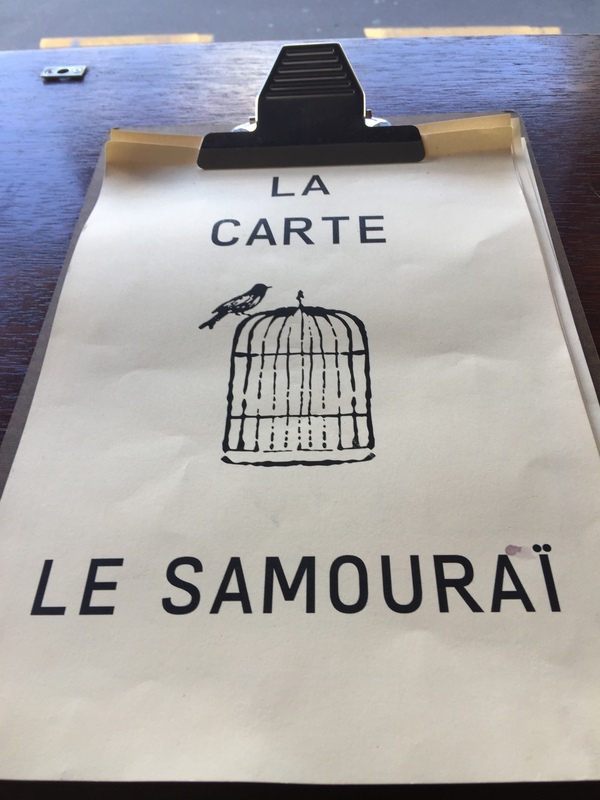 This time quite unexpectedly down Courtenay Place end of town, under Chow on Tory St; le Samourai. Chow owners continue to build their empire. Their inspiration came from a French film of the same name and they’ve replicated the fitout as per the film as well. 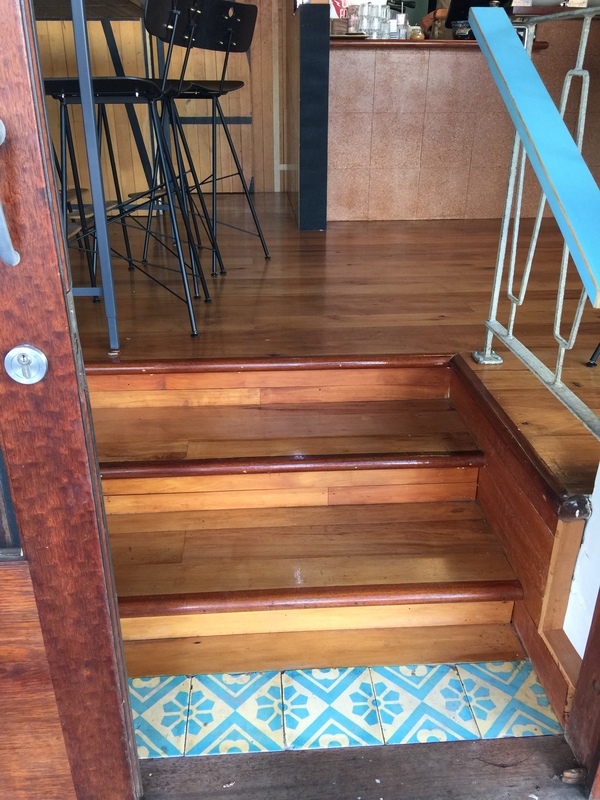 I loved the gorgeous entrance; turquoise tile step followed by wooden steps. 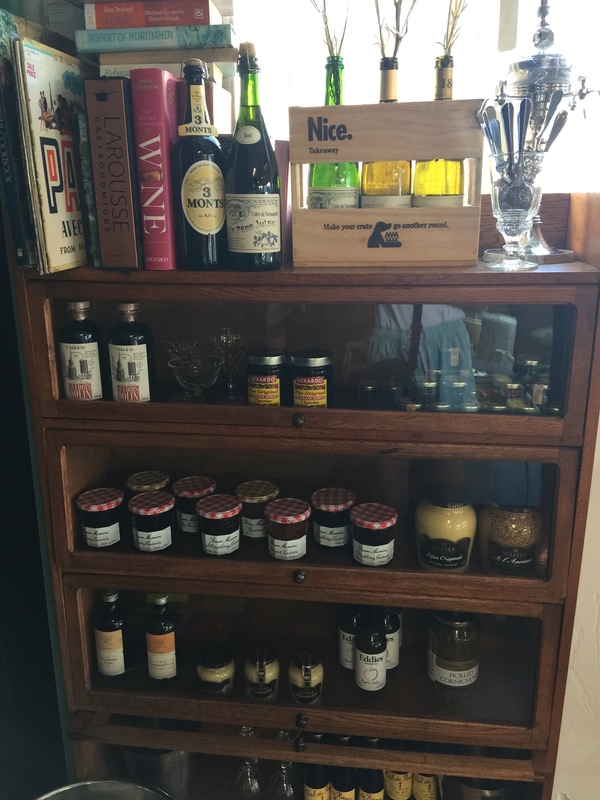 The place is light and funky with a mix of large and small tables, window seats and a shelf stocked with yummy French preserves. These guys only opened late December and then closed abruptly over the Christmas/New Year period. We called in for lunch after a 90 minute walk so we were hungry. There was a guy waiting for a takeout coffee and another local couple finishing their coffees and once they left it was just us with one other customer doing a takeout. The menu food-wise is small and split into breakfast, after 1130 and all day options. No steak pommes-frites in sight. You can have a breakfast croissant or 5 grain bread with butter and preserves or a champagne ham and cheese croissant, or Croque-Monsieur. 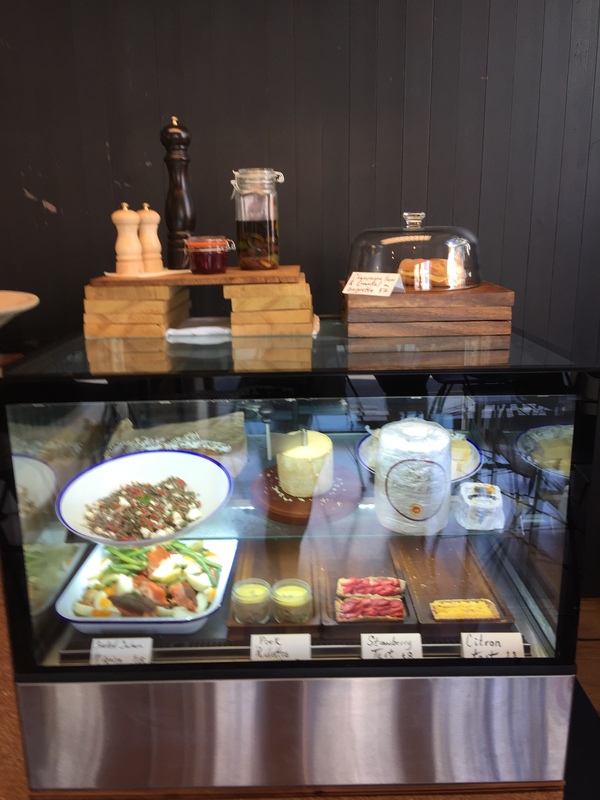 Or you can have a salmon or lentil salad for lunch or opt for a charcuterie or cheese platter. Drinks-wise the menu is massive. You can choose a glass/bottle of French white, red, rose vino or sparkly. Champagne is only sold by the bottle. 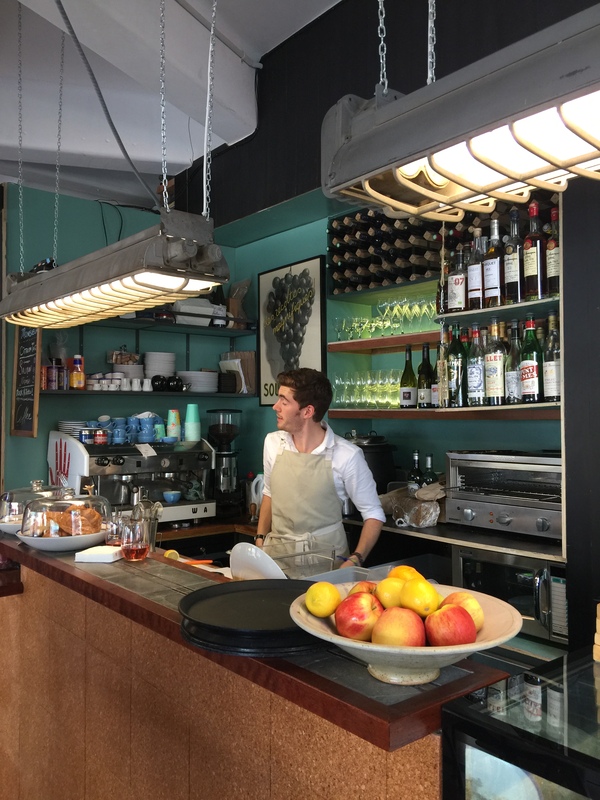 They also have vermouths, apertifs, digestifs, beer, cider, cold drinks, mixed drinks, spirits and coffees. We chose a prime seat by the open window. 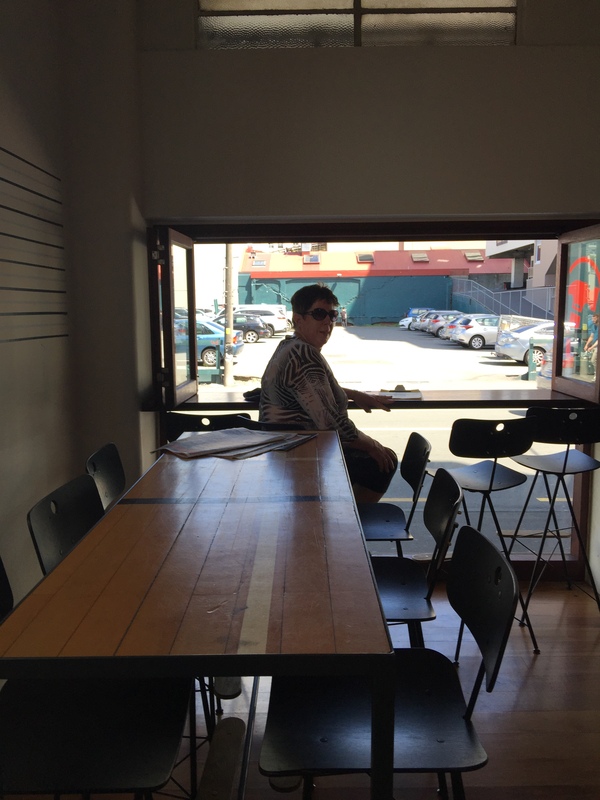 Great for people-watching and I waved and chatted to a friend as he walked by. Very French. The barista/waiter/chef was flying solo so he wasn’t rushed off his feet. I don’t think he would have coped with any more peeps though, as our food took forever. He was very friendly though and kept updating us with information about the place. Meanwhile he was obviously trying to get our croquet-monsieur perfectly toasted golden-brown. Other things in the cabinet were their sweets which don’t get replenished when sold out. The lonely pastry on the counter looked lovely however the tartine and fruit tartes were very sad-looking. The waiter advised their current supplier French Cancan hadn’t reopened yet. Clearly. Potentially they could consider Pandoro as they’re pretty darn good or The French Baker or La Cloche. Unfortunately the pork rillettes tartine on the specials board (2 specials) wasn’t available? However Mr Waiter said he’d rustle us up something similar. We had no idea what he said but we said a big YES please. 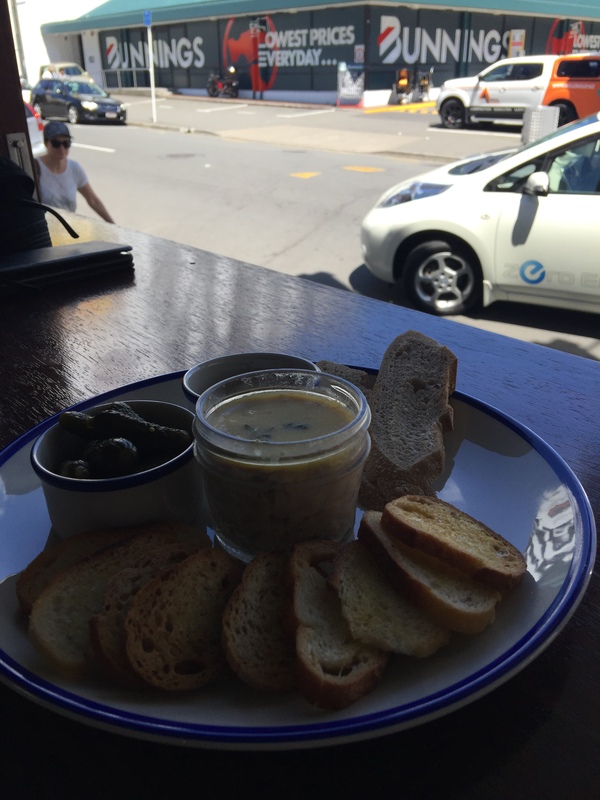 We got this wee pot of pork rillettes pate I think, (tasted like tuna) with some cornichons, yummy mustard and toast. It was great. 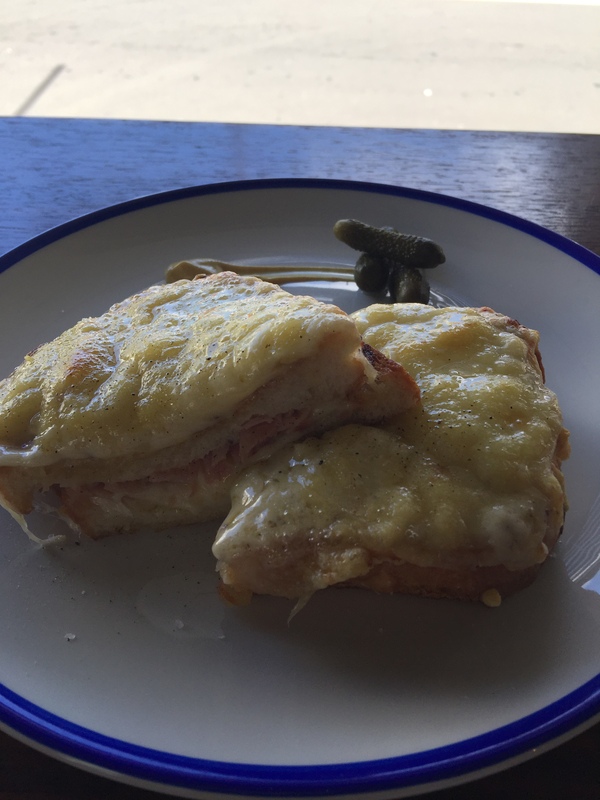 As for our croque-monsieur we split, which took ages, it was divine. Very cheesy and a yummy authentic roux inside with the ham and cheese. I’m not quite sure why this place is open for breakfast or lunch really as it is definitely a wine bar. It seems a little lost in translation. Not sounding like a judge from ‘The Voice’ but I think they’re still not quite sure who/what they want to be. However if they work at their marketing, they may pull in the local apartment dwellers or corporates for a croissant or coffee. The retirees will have time to wait for a croque-monsieur but the corporate commuters maybe not, unless they have a meeting there. If they get an influx of peeps all at once, that may be a challenge. 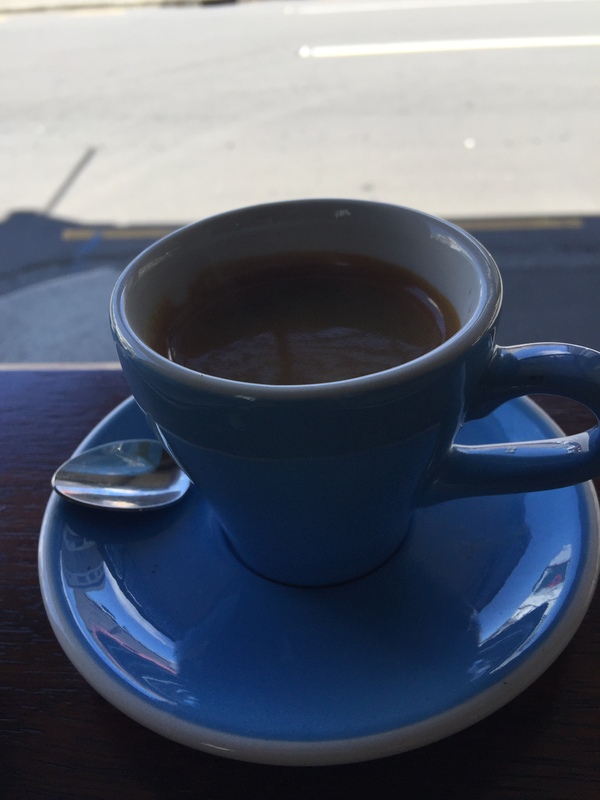 We finished with a couple of long blacks. Pricing was very good. I did pop back for an impromptu visit just for coffees with my gorgeous friend Sophie who owns The Greek Food Truck. Coffees were good but took ages. Service very friendly but still feel sorry for the guy flying solo? Hubby and I adore all things French, so I’ll definitely return for a nightcap on the way home from dinner and also try out many of the other froggie drinks and platters with friends. I’ll also pop in for a croissant with preserves as a real treat. Bonne chance le Samourai with your work in progress. A bientot. P.S BTW They’ve now decided to close Sun and also closed on Mon, Tues.